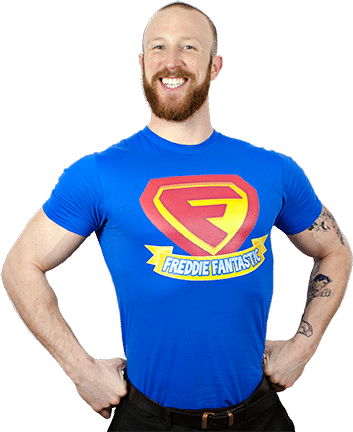 Freddie Fantastic is your children’s birthday party entertainment superhero! 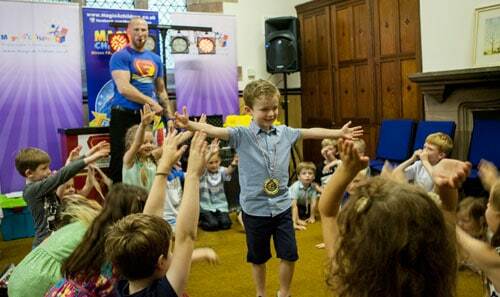 Freddie delivers a fast paced, fun filled, action packed 2 hour party formula in Cheshire and surrounds, including Chester, Manchester and Stockport. The party entertainment is perfectly suited for 4 - 8 year olds. The birthday star is the superstar of the day guaranteeing the party of a lifetime for your child. You get to enjoy it all completely free of stress as Freddie Fantastic takes care of it all. Even the prizes are included! You are guaranteed a successful party with everyone having the best party ever. You get to enjoy watching your child having the best time ever as Freddie Fantastic manages your whole party. From the moment your child’s first party guest arrive, Freddie Fantastic engages everyone in fun games and activities making your child’s party a non-stop engaging experience from beginning to end. The 2 hour party formula is jam-packed with entertainment including interactive games, dancing activities set to upbeat music, competitions, comedy, magic, puppets and prizes. Freddie’s secret to success is the use of the 4 - 8 year old age group’s competitiveness of to have everyone participating from start to finish. Your child is the superhero of the party and is made to feel like royalty. All this leaves you free to enjoy a stress free party on your child’s special day. 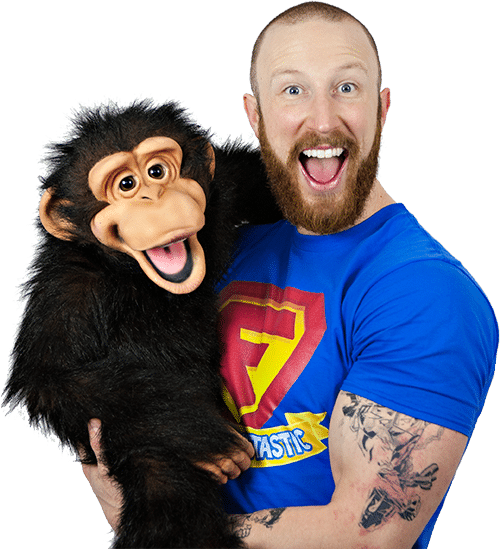 Freddie Fantastic has been engaging and entertaining children for over 5 years, from teaching to coaching to entertaining. His rich background gives you peace of mind that he will both entertain everyone while being respectful at all times to guarantee a party experience your child will never forget. Birthday party magic, games and disco with a funny speaking monkey puppet, comedy magic, engaging party games and a super kids disco. And prizes are included! 2 hours of non-stop action and entertainment that will have all the guests at your party (including the grownups) clasping their bellies with laughter, gripping the ends of their seats in anticipation and jumping with excitement. Good clean fun with age appropriate magic, music and games will have your party guests rocking the party room like in the good old days. The games, magic and disco show travels anywhere in the Warrington, Cheshire, Manchester, Liverpool and surrounding areas of the Northwest. Without a doubt Freddie was awesome today. Lola-Kate was totally thrilled with her party and Freddie did the amazing job I have seen him perform before. So many parents commented on how brilliant he is with the children. Total credit. I just wanted to say a huge thank you to Fantastic Freddie for giving Louie the best 5th birthday party that he could have wished for. Freddie kept the room of 24 kids entertained and transfixed on the show from the moment they arrived to when they left. I received lots of positive feedback from the parents/grandparents about how entertaining they found it too. Louie had a brilliant day and certainly felt very special. All of his friends were involved too and I couldn't believe how Freddie could remember each of their names! It was a huge success and I got to sit back and enjoy watching the kids all loving the show.